Spring is in the air. With the arrival of spring comes an overwhelming desire to clean…clean everything. Over the years I have learned that the best way to clean is to stick to the basics. 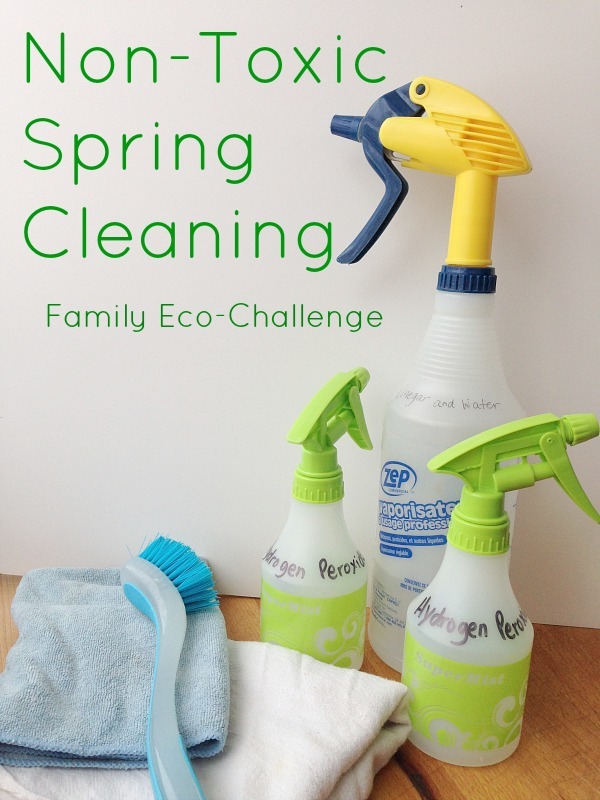 This week’s Family Eco-Challenge is to give non-toxic spring cleaning a try. Okay, what do I mean when I say “natural products”? Good question. I mean products that come from nature. Products that don’t have a long list of ingredients. Products that actually only have one ingredient on their list. It is quite amazing how effective a very few number of items can be. I’ve put together a list of items that need to be on an eco-friendly cleaning list. I am telling you, cleaning with natural products will change your entire spring cleaning experience…for the better. White Vinegar Vinegar is an acid. White vinegar is basically made from fermented corn, that is filtered multiple times. The resulting acid is strong enough to kill bacteria that can be found in our homes. I love cleaning with vinegar. There are many, many ways to clean with vinegar…in fact the site vinegartips.com is entirely devoted to the love of vinegar. Here are 5 ways that we use vinegar to clean our house. Clean Pet Messes – Use a spray bottle that is filled with water and vinegar (half and half) and spray on the pet mess. This will completely clean the surface. If the mess is on fabric, be sure to test spray the solution in a inconspicuous spot first. Rinse Agent – Need to fill the rinse agent compartment in your dishwasher? Use vinegar…straight vinegar to replace the rinse agent. Window Cleaning – Use a micro fibre cloth or a lint-free rag, and the same spray bottle used for cleaning up pet messes to clean windows and mirrors…streak free. Floor Cleaning – Fill a bucket with 1/2 cup vinegar and 1 gallon of warm water. 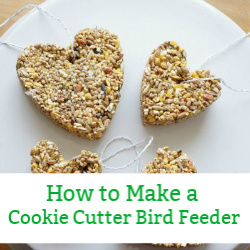 We use this solution to clean tile floor and our hardwood floors. Our floors are not waxed…test this mixture on waxed floors first. Salt Stain Removal – Vinegar is perfect for getting rid of salt stains on boots, shoes, car floor mats, fabric, floor mats and floors. We use our vinegar a lot in the winter months. Baking Soda Baking soda, or sodium bicarbonate, is a mildly abrasive powder that we use most often to bake in the kitchen. Sodium Bicarbonate is used as a leavening agent in baking. In cleaning, we love it’s abrasive nature…not too abrasive to damage surfaces commonly found in our home. The combination of white vinegar and sodium bicarbonate create cabonic acid, thus increasing the acidity of the vinegar…greater cleaning power. Here are 5 ways we use sodium bicarbonate to clean in our house. Clean Up Messy Mattresses – If a child has an accident, or is sick, in bed we start by removing the bedding, then clean up the mess with the vinegar solution used above. To completely remove all odour, sprinkle the mattress with baking soda…let the baking soda sit on the mattress surface for at least 3 hours. Once the baking soda has dried, vacuum up the soda and take the odour with it. Dish Duty – Sprinkle baking soda in the bottom of those hard to clean pots and pans. Baking soda will give your scrubbing a boost. Ring Around the Tub – Baking soda is the perfect abrasive for cleaning tiled surfaces and bathtubs. Sprinkle baking soda in the tub and use a scrub brush to remove the pesky ring around the tub. Grout Cleaner – Make a paste of baking soda and vinegar…use a scrub brush to clean grout in the shower. Deodorizer – A sprinkle of baking soda works as a great deodorizer…in the fridge, in the dishwasher, in the kid’s gym bag, in the kid’s shoes and anywhere else that is a little stinky. Non-Chlorine Bleach – Here is something that was news to me. Did you know that non-chlorine bleach is basically hydrogen peroxide at higher concentration level (about 10%). The hydrogen peroxide that can be purchased at the drugstore is about 3%. I have been using non-chlorine bleach to clean our house for years. Hydrogen peroxide has recently become the trendy eco-cleaner…I’ve been using it all along…how on trend am I?! So, whether you use the higher concentration non-chlorine bleach or the little brown bottle hydrogen peroxide from the drug store, you will be safely bleaching, whitening and cleaning your home. 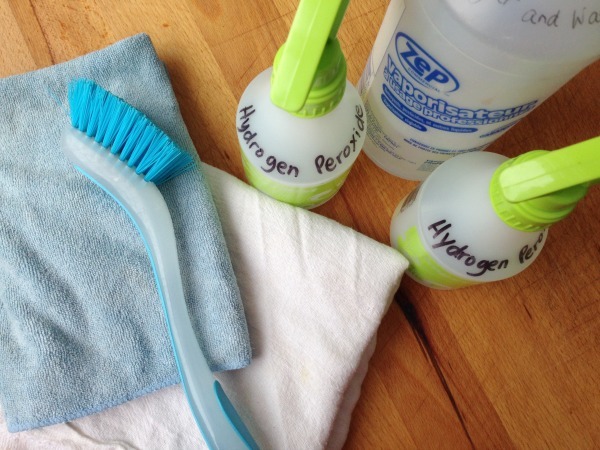 Here are a few ways we use hydrogen peroxide in our house. Laundry Room – Add 1/4 cup to your laundry and whiten those whites. Use a bucket with 1/2 cup non-chlorine bleach and gallon water to clean the rubber lining of the washing machine…front loaders can get so moldy. Post-Family Sickness Clean Up – When anyone is sick in our house, I go on a cleaning rampage. Fill a spray bottle with hydrogen peroxide and clean all the frequently touched surfaces in the home; railings, door knobs, light switches, remote control, computer, telephones, etc. Toilet Bowl Cleaning – Pour a big swig of non-chlorine bleach into the toilet bowl and let it sit for a few minutes, give the toilet a scrub and the toilet is clean. Hydrogen Peroxide and Vinegar – Okay, while hydrogen peroxide and vinegar are excellent bacteria killers on their own, when used in combination they are even better. Here’s the catch, research shows that it is most effective to not actually mix the liquids, rather spray them one after the other. It is actually 10 times more effective than using either spray on it’s own. Spray the surface with vinegar and then spray with straight 3% hydrogen peroxide and wipe clean. Rags, Scrub Brush, Old Towels and Microfibre Cloths – It doesn’t matter what solution you choose if you aren’t using the right tool for the job. Keep those old toothbrushes, they are perfect for cleaning grout and cleaning around taps. Micro fibre cloths clean windows and are great for dusting electronics. Old t-shirts and old towels are great for cleaning just about anything and everything. 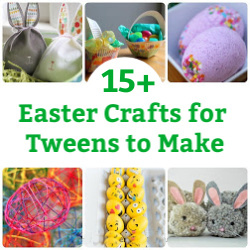 Pick up a scrub brush for the bathroom and another one for the kitchen. That’s it. Those are the only cleaning supplies that we use. Seriously. It is pretty amazing to think of the money we are saving by not purchasing a specific cleaner for each and every task in the house. When I think of cleaning our house, the places we eat, touch and sleep, I feel comfortable knowing that we are not using harmful cleaning chemicals. If you want you can always add essential oils to your spray bottles. If you love the scent of lavender, then add a drop or two. However, I have learned to love the smell of nothing…just the smell of clean. Okay, now I want to hear from you. What do you use to clean your house? What are your best tricks and tips? Want to see all the changes we have made so far in our Family Eco-Challenge? 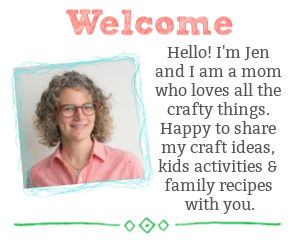 Take a look at the Family Eco-Challenge page…we would love to have you follow along.